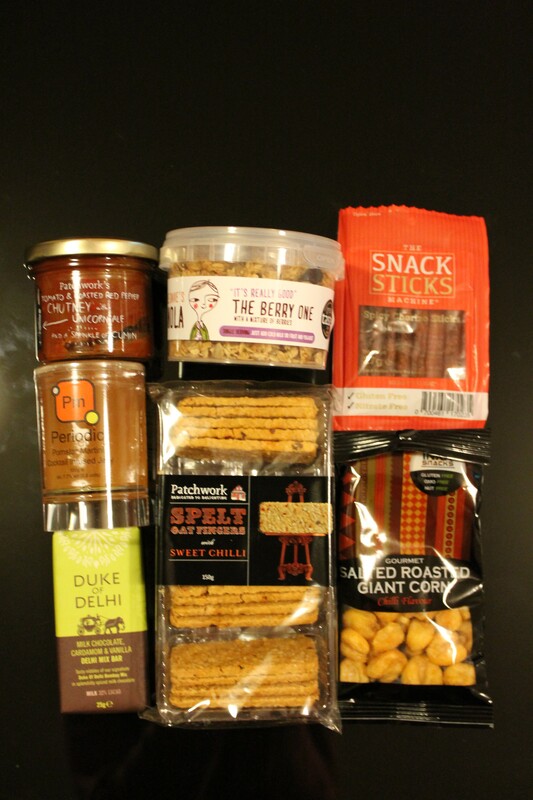 Flavourly box – Tasting the World – On the road, with stuffed hand luggage and face. Camera in my hand. 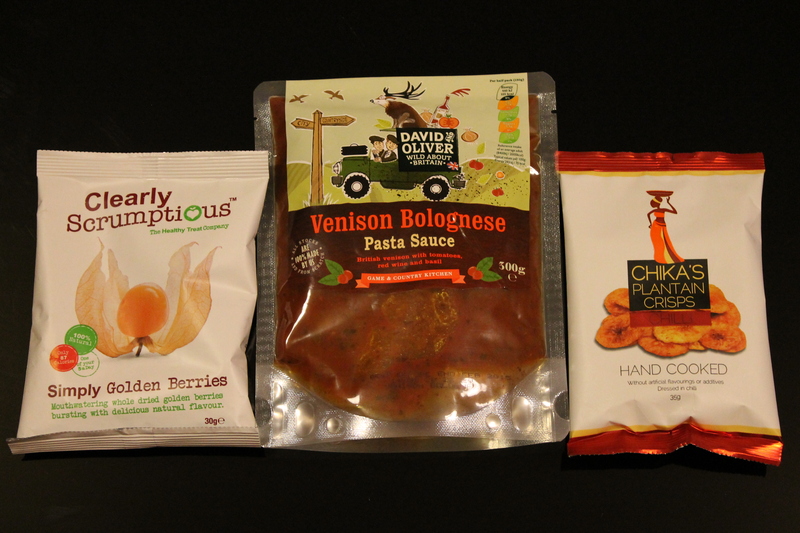 Today I received another Flavourly box! What was inside this time? Simply Golden Berries by Clearly Scrumptious. I had them before and I wasn´t impressed. I wish they sent me dried cherries or cranberries, which they offer as well. Venison Bolognese – pasta sauce by David and Oliver Foods. Flavour: British venison with tomatoes, red wine and basil. I am curious about this sauce, because I like red wine in sauces. Sounds promising, I will definitely use it soon. Chika´s plantain crisps, with chilli flavour. These are crisps from plantain potatoes, although on the picture it looks more like slices of bananas. I tried them straight away and first I couldn´t feel much of the chilli flavour. Then I had some more and I have to say the spiciness is just right, increasing with the amount of crisps eaten. Patchworks Pate´s tomato and roasted red pepper chutney with Unicorn ale and a sprinkle of cumin; Patchwork Pate´s spelt oat fingers with sweet chilli. These are, I guess, supposed to be eaten together. Sensible Dave´s granola with a mixture of berries. This one will go with me to the office. It will be great for breakfast with white or Greek yoghurt. Spicy chorizo sticks. Will be fine to munch on while watching TV or something. Milk chocolate, cardamom and vanilla Delhi mix bar. A pocket-size bar of chocolate, it will not last long, that´s for sure. Gourmet salted roasted giant corn, with chilli flavour. By Inka Snacks. promo leaflet for contact lenses. I have no idea what contact lenses have to do with food, I don´t like this type of advertising when the promoted product doesn´t have anything to do with the box contents. 10% discount for Stack magazine subscription. 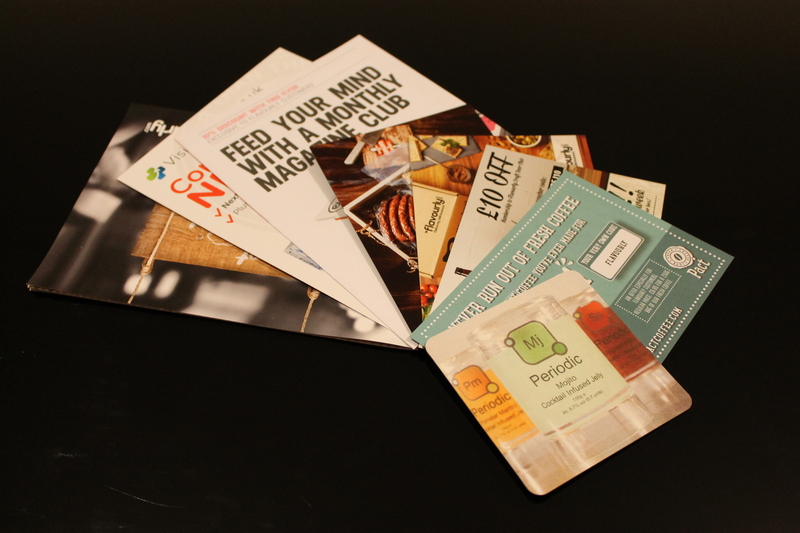 Flavourly Craft Beer Club promo card. We Love Jelly promo card, shaped like a beer (cocktail) mat. A nice idea. That was it. Lots of good stuff again. Wanna have your own Flavourly box now? Previous Post A brand new Flavourly box!